As many you of you know, with BlackBerry Bold and BlackBerry Thunder (Storm), Research In Motion has been moving full speed ahead into the retail consumer space trying to win market shares. Along with BlackBerry Pearl, BlackBerry Bold, and the BlackBerry Thunder (Storm), BlackBerry Unite! is part of retail consumer strategy to win you over. What is BlackBerry Unite! ? Basically it is a dumb down version of the BlackBerry Enterprise Server (BES). Like the BES, BlackBerry Unite! lets you monitor user usage; for instance, you can see who your daughter is call and how often. Or you can see what URL your top sales guy is browsing and maybe block certain website. In addition to the "control freak" features, you can also share calendar, address book, and best of all, file sharing. In today's lesson, we will take you one step at a time into how to install BlackBerry Unite! and how to get up and running with user setup with BlackBerry Unite! Getting Up and Running with BlackBerry Unite! Internet Explorer 6.0 or higher installed. On the BlackBerry side, BlackBerry OS 4.3 or higher is fully supported. OS 4.0 to OS 4.2.1 is supported with reduced functions. According to the documentation, if you have a tight firewall, you must use a transparent firewall. I am running ZoneAlarm Security Suite version 7.0.483 without any conflicts with the BlackBerry Unite! Visit the BlackBerry Unite! Download page and download from your preferred carrier or location. If you're not sure, choose the "Research in Motion" option. Installation is very simple. Just answer the questions on screen (installation path, country/region...etc). When installation is finished, Internet Explorer should launch the BlackBerry Unite! Admin Console: http:// localhost:8080/unite/pages/login.jsf. You can also invoke the Unite! Console page by going to Start->Programs->BlackBerry Unite!-> BlackBerry Unite! Web Admin. In addition, you should see a little server icon running MSSQLServer, see Figure 1. If you do not see MSSQLServer running and the Admin Console shows up empty in IE, restart your machine and try again. When you first open the Unite! Web Admin Console, it will prompt you to register. See Figure 2. 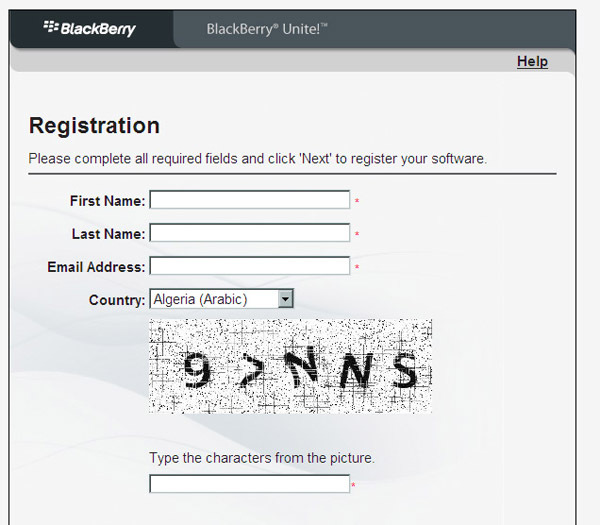 After you've registered, the first thing you should do is add your own BlackBerry to Unite! 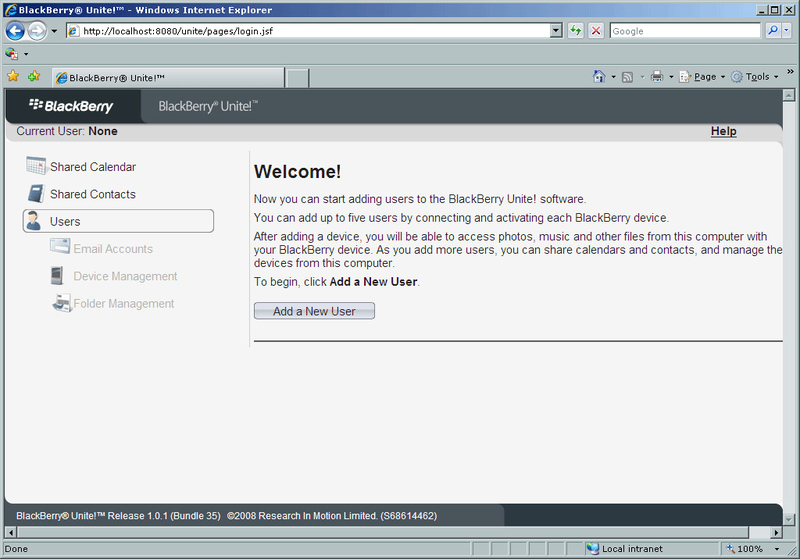 by connection your BlackBerry to the PC via USB cable, and then click on Add User button on the Welcome screen. Figure 3 - Welcome screen, where you can add user. After you have added a user to Unite!, you will see on the BlackBerry device several Unite! icons. In Figure 4, I have placed all the Unite! icons within a folder, for illustration purposes. The 3 icons start from the right belongs to Unite!. The first icon on the right is the Unite! email address that you can setup. The second icon from the right is Remote Device Management. The third is Download Manager. A word of caution on the registering email on Unite! - don't register an email address that you've already registered with the BIS. Or if you do, un-register the same email address from BIS. Why? Have the same email address registered on BIS and Unite! means you will get the same email twice. You don't want that. So, if you don't want to add an email to Unite! when you are adding user, simply don't key in email address and password. Figure 4 - BlackBerry Unite! icons on your home screen. From the Web Admin Console, click on Shared Calendar. Click on Add Event and fill in the Event details, see Figure 6. 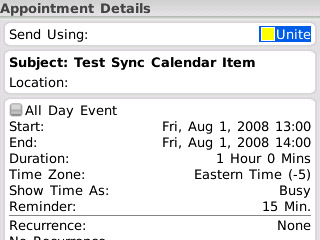 As soon as you hit Save, all registered BlackBerry device will have the event sync-ed up. See Figure 7. Tip, if you are running OS 4.3 or higher, you can pick a different color for different Calendar Service. As you can see from Figure 7, Unite! on my BlackBerry is yellow colored. Hint, you can choose the color of Calendar from Calendar Options. Again, this only works for BlackBerry OS 4.3 or above. Another cool feature is that you can browser the file directory on your BlackBerry and download the files you want. From your BlackBerry, click on Download Manager, see Figure 4. Then you will see a screen similar to Figure 8. From there, you can select "Browse remote files" and download any file you want, and download, see Figure 9. The BlackBerry Unite! 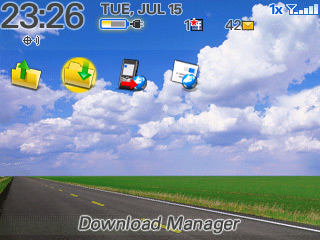 allows user to sync files in a designated folder automatically when the BlackBerry is connected to the PC via USB. This feature can be used for large file set (like movies, music) that you download. It would probably be good for a device like the BlackBerry Pearl / Curve / Bold, which all have great video playback capabilities. 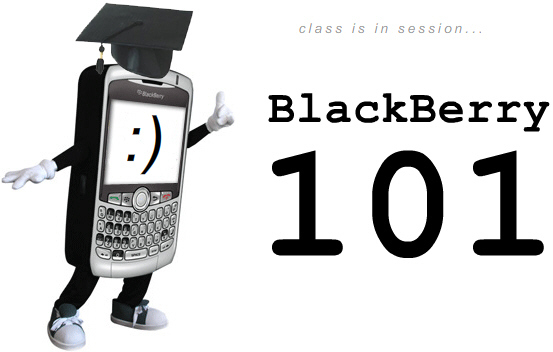 To set the designated folder, from the Web Admin, select a BlackBerry user, then select Folder Management, see Figure 10. 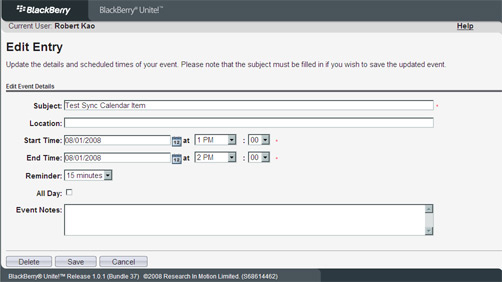 In Folder Management, you can select which folder the BlackBerry syncs with every time the BlackBerry is connected via USB. What's the difference between Step 5 and Step 6? Step 6 is for getting larger media files on to your BlackBerry, where Step 5 is great for documents. You can let your inner control freak let loose with the management features. From the Web Admin Console, select a user name, and then click on Device Management on the left navigation, see [Figure 5]. Restrict certain URL (your own version of "WebSense"). To do this, you have to set "Browse the internet using" BlackBerry Unite! browser. Just released on July 31, 2008, BlackBerry Unite! Automatic software MR updates are updates to BlackBerry Unite! software. 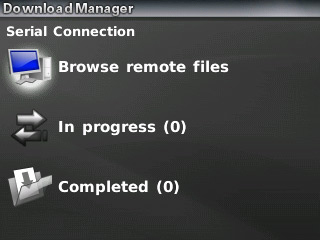 These MR software updates install automatically on computers running BlackBerry Unite! software and include new features and functionality. To start using the new features, Unite! existing Unite! users need to reactive the BlackBerry they are running on Unite! BlackBerry Unite! 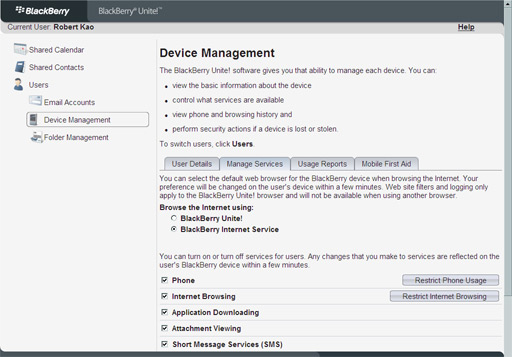 software MR2 is designed to allow users to reset service restrictions on BlackBerry smartphones to the default settings by clicking a button. BlackBerry Unite! software MR2 introduces the functionality to restrict file transfers. BlackBerry Unite! software is designed to allow users to disable file transfer to or from a BlackBerry smartphone, or place a file size limit on file transfers. BlackBerry Unite! software MR2 is designed to allow users to define the amount of time BlackBerry Unite! software will wait before polling messaging servers for new email messages. A longer polling interval will decrease network activity, and a shorter polling interval will cause BlackBerry Unite! software to check for and retrieve email messages more frequently. BlackBerry Unite! software MR2 includes support for rich content email messages. Hope you enjoy BlackBerry Unite! For more information and help, be sure to visit our BlackBerry Unite! forum.